Set you ride apart from the rest with this unique Rally Graphic kit. Easy-to-apply kit is packaged with PRECUT pieces, ready to install, in a wide variety of colors - NO TRIMMING required (except for vehicle models with Sunroof option)! 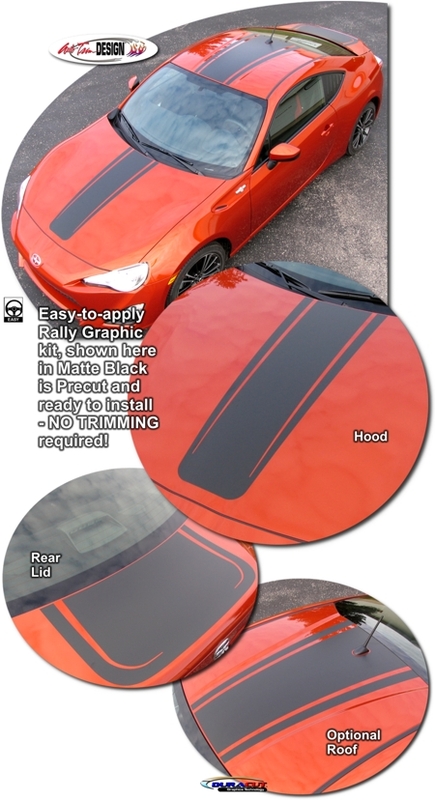 This kit is specifically made for '13-Current Scion FR-S or Subaru BRZ factory hood, roof and rear hatch/lid areas and will not fit any other vehicle. Base kit includes Hood and Rear Hatch/Lid pieces only. Roof piece is available as an optional kit.